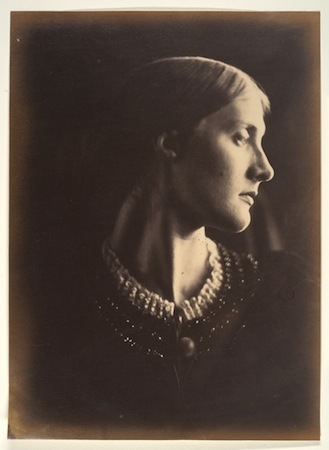 Staring out over her left shoulder, neck muscles strained by the severity of her pose, Julia Margaret Cameron’s photograph Mrs. Herbert Duckworth is a striking portrait of the artist’s niece. The deep shadows emphasize the curves of her cheek and neck, throwing a large portion of the photograph into semi-darkness, while the light that shines down from the left side of the picture emphasizes the sitter’s downcast eyes, nose and mouth. Mrs. Herbert Duckworth, one of Cameron’s most famous images, is an enduring portrait of a Victorian woman. Only 21 at the time of the photograph, Julia Prinsep Jackson had just recently become Mrs. Duckworth when the picture was taken. A scant three years later, Mrs. Duckworth was a widow with two young children and a third on the way. Later, in 1878 she married Sir Leslie Stephen, a prominent Victorian journalist and mountaineer. Four more children were born, including daughters Vanessa Bell and Virginia Woolf who would become famous as members of the Edwardian artistic circle known as the Bloomsbury Group. The close-up focus on the face is typical of Cameron’s portrait style and can be seen in many images of the sitter by her aunt. The strong contrast of dark background and dark dress against the pale face is similarly common in Cameron’s photographs. Mrs. Duckworth’s severe, unsmiling features are also typical of the Victorian era since the exposure time then required for a photograph was several minutes, much too long to hold a smile. Julia Margaret Pattle Cameron was born in India and married Charles Cameron in 1838. The couple returned to England in 1848 and became actively involved with an intellectual group of artists and writers that included Alfred Lord Tennyson and George Frederick Watts. At the age of 48, Cameron began to experiment with the collodion method of photography after receiving her first camera as a present from her daughter. Creating a collodion print was an extremely difficult and hazardous process that required working with combustible materials in almost total darkness. The collodion process involved pouring chemicals onto a glass plate negative. The plate was then inserted into the camera, and the plate exposed for three to eight minutes. After exposure, the plate was removed and immediately developed in a darkroom. It was important for the plate to remain “wet” throughout the entire process. Cameron recorded in her memoir Annals of My Glass House (1874) that she ruined many household items running through the house carrying dripping photographic plates. Nevetheless, the collodion process was a great improvement over previous photographic methods due to the sharper images and the fact that multiple prints could be made from a single plate. Cameron’s artistry, skill and knowledge of the science of photography is obvious in a portrait like Mrs. Herbert Duckworth. The clear focus and dramatic pose combine with the manipulation of light and dark to create an image that is at once strong and feminine. It is a photograph that not only captures a moment in time, but also provides the viewer with an evocative image of Victorian womanhood. Cite this page as: Dr. Rebecca Jeffrey Easby, "Julia Margaret Cameron, Mrs. Herbert Duckworth," in Smarthistory, August 9, 2015, accessed April 19, 2019, https://smarthistory.org/julia-margaret-cameron-mrs-herbert-duckworth/.